A contract for the sum of $218,000 for two projects that will enhance the traffic flow and safety through lane markings in the busiest roadways of San Ignacio and Santa Elena and Belmopan was signed this morning at the Social Investment Fund (SIF) headquarters in Belmopan. The contract was signed by the Executive Director of the Social Investment Fund, Mr Daniel Cano, while Mr Hugo Lemus signed on behalf of Modern Construk, a construction company based in San Ignacio, which was the successful bidder of the project. Present at the ceremony were Mr Simeon Lopez, Mayor of Belmopan and Ms. Yingwei Wu, Senior Procurement Officer at the World Bank. 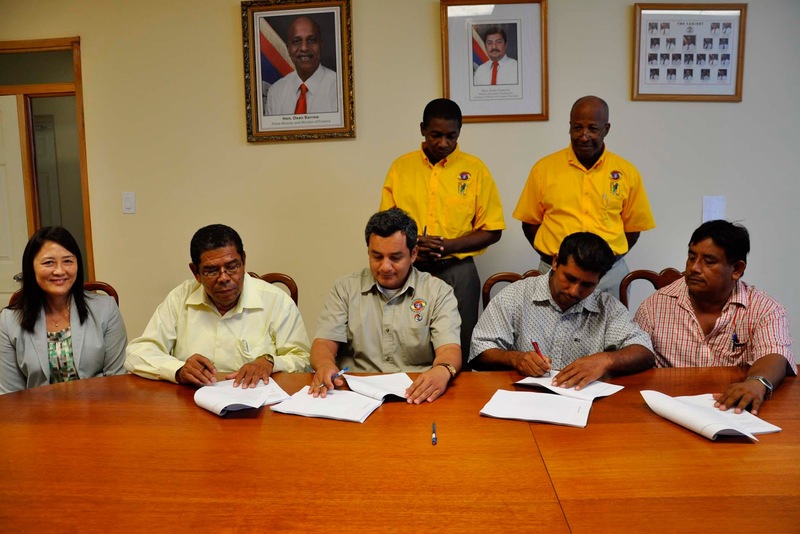 The contract represents the formal launching and the first civil works projects being undertaken as part of the Belize Municipal Development Project, BMDP, which will be implemented in the various municipalities throughout Belize. These include Benque Viejo, San Ignacio and Santa Elena, Belmopan, Dangriga, Punta Gorda, Orange Walk and Corozal. Later this year bids will be invited for the construction of a modern market in Dangriga and a new multipurpose centre for Punta Gorda as well as bids for the construction of drains and paving of streets in the participating municipalities. The project in San Ignacio and Santa Elena entails the enhancement of the intersection between Burns Avenue and Savannah Street by the installation of bollards, raised medians and marking of the approach lanes and configuring the intersection to allow for better traffic flow. The improvement will allow pedestrians greater access to stores, street vendors, hotels and shopping areas in downtown San Ignacio. Under the project, the main entrance to the drop off/loading area of the Santa Elena Primary School will also get a facelift. The project will entail the paving of a formal loading/unloading zone at the main entrance of the school, including the installation of a footpath along the zone to allow students safe passage, installation of kerb and channel to facilitate surface drainage flow to the adjacent drain and installation of an improved stop sign for speed control. Meanwhile, the project for Belmopan entails the improvement and lane marking of Constitution Drive North Ring Road, Constitution Drive South Ring Road and the junction of Constitution Drive and Forest Drive. The lane markings will improve the legibility of the road, enhance safety especially during poor visibility in rain storms and night driving. 3. Narrow Forest Drive by placing a raised median island, defining only one exit lane. For further information please contact Mr Mike Hernandez Jr. J.P., Director of Public Relations of the Social Investment Fund, at Tel: 822-0239, via email at mike.hernandez@sifbelize.org or Cell No. 634-4002.